Tavares, F., Lapolli, F. R., Roubach, R., Jungles, M. K., Fracalossi, D. M. & Moraes, A. M. Use of Domestic effluent through duckweeds and red tilapia farming in integrated system. Pan-American Journal of Aquatic Sciences, 5(1): 1-10. Download PDF file (253 Kb). Cetra, M., Sarmento-Soares, L.M. & Martins-Pinheiro, R.F. Peixes de riachos e novas Unidades de Conserva��o no sul da Bahia. 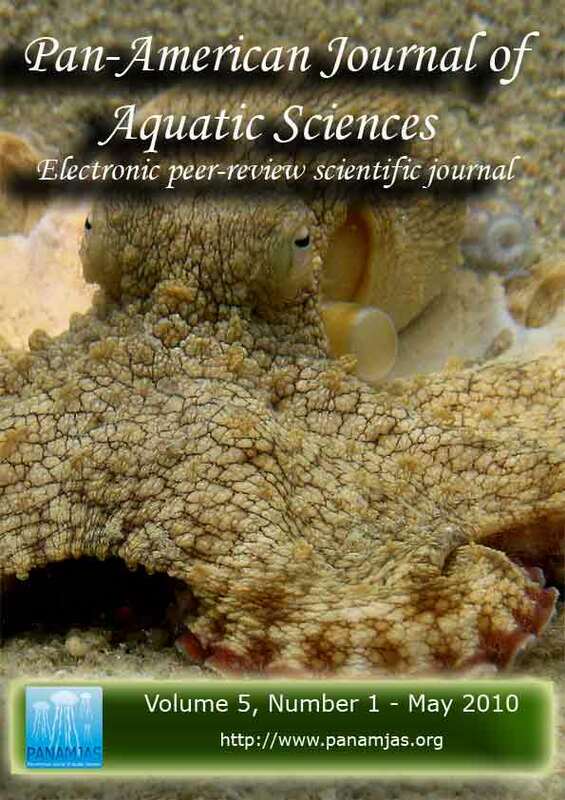 Pan-American Journal of Aquatic Sciences, 5(1): 11-21. Download PDF file (358 Kb). Macchi, G. J., Martos, P, Reta, R. & Dato, C. Offshore spawning of the Argentine hake (Merluccius hubbsi) Patagonian stock. Pan-American Journal of Aquatic Sciences, 5(1): 22-35. Download PDF file (1,015 Kb). Kemenes, A., Forsberg, B. R., Magalh�es, C. & Anjos, H. Environmental factors influencing the community structure of shrimps and crabs (Crustacea: Decapoda) in headwater streams of the Rio Ja�, Central Amazon, Brazil. Pan-American Journal of Aquatic Sciences, 5(1): 36-46. Download PDF file (643 Kb). Sarmento-Soares, L.M., Mazzoni, R. & Martins-Pinheiro, R.F. A fauna de peixes na bacia do Rio Itanh�m, leste de Minas Gerais e extremo Sul da Bahia. Pan-American Journal of Aquatic Sciences, 5(1): 47-61. Download PDF file (967 Kb). Bjornberg, T. Quinquelaophonte varians n. sp. (Copepoda, Harpacticoida, Crustacea) and notes on its developmental stages. Pan-American Journal of Aquatic Sciences, 5(1): 62-77. Download PDF file (1,519 Kb). Garc�a, C. B. Conocimiento tradicional: lo que los pescadores artesanales del Caribe colombiano tienen para decirnos. Pan-American Journal of Aquatic Sciences, 5(1): 78-90. Download PDF file (270 Kb). Garc�a-Rodriguez, F., Hutton, M., Brugnoli, E., Venturini, N., del Puerto, L., Inda, H., Bracco, R., Burone, L. & Muniz, P. Assessing the effect of natural variability and human impacts on the environmental quality of a coastal metropolitan area (Montevideo Bay, Uruguay). Pan-American Journal of Aquatic Sciences, 5(1): 91-100. Download PDF file (844 Kb). Garrone Neto, D. Considera��es sobre a reprodu��o de duas esp�cies de raias (Myliobatiformes, Potamotrygonidae) na regi�o do Alto Rio Paran�, Sudeste do Brasil. Pan-American Journal of Aquatic Sciences, 5(1): 101-111. Download PDF file (961 Kb). Fabre, A., Carballo, C., Hern�ndez, E., Piriz, P., Bergamino, L., Mello, L., Gonz�lez, S., P�rez, G., Le�n, J. G., Aubriot, L., Bonilla, S. & Kruk, C. El nitr�geno y la relaci�n zona euf�tica/zona de mezcla explican la presencia de cianobacterias en peque�os lagos subtropicales, artificiales de Uruguay. Pan-American Journal of Aquatic Sciences, 5(1): 112-125. Download PDF file (459 Kb). Spach, H. L., da Silva, A. L. C., Bertolli, L. M., Cattani, A. P., Budel, B. R. & Santos, L. O. Assembleias de peixes em diferentes ambientes da desembocadura do Rio Sa� Gua�u, Sul do Brasil. Pan-American Journal of Aquatic Sciences, 5(1): 126-138. Download PDF file (415 Kb). Barbieri, E., Gon�alves, C. A. & da Silveira, L. F. Ocorr�ncia do Phalaropus tricolor (Vieillot, 1819) (Scolopacidae) no estu�rio da Ilha Comprida, S�o Paulo, Brasil. Pan-American Journal of Aquatic Sciences, 5(1): 139-142. Download PDF file (213 Kb). Aguilar-Pereira, A. & Tuz-Sulub, A. N. Hypoplectrus gemma (Teleostei, Serranidae) is not endemic to southern Florida waters. Pan-American Journal of Aquatic Sciences, 5(1): 143-146. Download PDF file (217 Kb). Bento, R. & de Melo, G. A. S. Morphological considerations and range extensions for species of the superfamily Squilloidea (Crustacea: Stomatopoda) in the southwest Atlantic. Pan-American Journal of Aquatic Sciences, 5(1): 147-152. Download PDF file (340 Kb). Rosim, D. F., Mesquita, R. L. B. & Luque, J. L. Occurrence of Gamispatulus schizodontis Thatcher & Boeger, 1984 (Cyclopoida, Ergasilidae) in the nasal cavities of Erythrinidae fishes from Brazil. Pan-American Journal of Aquatic Sciences, 5(1): 153-156. Download PDF file (110 Kb). Ben Souissi, J., Ben Abdallah, L. G., Ben Amor, M. M., Ben Salem, M. & Capap�, C. Confirmed occurrence of the royal flagfish, Aulopus filamentosus (Osteichthyes: Aulopidae) in Tunisian waters (Central Mediterranean). Pan-American Journal of Aquatic Sciences, 5(1): 157-161. Download PDF file (294 Kb). Martinelli, M. M. Record of opportunist predation of Marine Catfish Genidens genidens Valenciennes, 1839 (Siluriformes, Ariidae) by the Crested-Carcara Caracara plancus Miller, 1777 (Falconiformes, Falconidae) in estuary of Jucu River, ES, Brazil. Pan-American Journal of Aquatic Sciences, 5(1): 162-165. Download PDF file (558 Kb). Alonso, L., Estrades, A., Scarabino, F. & Calcagno, J. Conchoderma virgatum (Spengler, 1790) (Cirripedia: Pedunculata) associated with sea turtles in Uruguayan shallow coastal waters. Pan-American Journal of Aquatic Sciences, 5(1): 166-168. Download PDF file (155 Kb). Camargo, F. V., Alves, D. F. R. & Cobo, V. J. Range extensions for three majoid crabs (Crustacea, Decapoda, Brachyura) on the coast of S�o Paulo state, Brazil. Pan-American Journal of Aquatic Sciences, 5(1): 169-172. Download PDF file (130 Kb).